This entry was posted in Discovering Me, Epic Adventures and tagged #thatmanmaysee, Alcatraz, fear, FTSF, San Francisco, swim by Nicki. Bookmark the permalink. You beautiful everything you. You will do it. I know so, with all of me. You will breathe, and kick and inch forward on the map while I hold my breath thinking of you breathing, knowing you will make it. Adore you, sweet Nix. MY WP account is messed up but I’m sharing this on the Finding Ninee Facebook page. Go get him Nicki! Those sharks wont know what hit em! But seriously, if you see sharks, hit em! Dankie Ma. Your words will keep me going! Love you! Wow! Such a major goal and I’m so impressed! Oh wow. I stood and took in the amazing sight of Alcatraz and the bay while up on some peak during my first visit to San Francisco last March. My kids were mesmerized by the stories told by our trolley driver but were too scared out of their wits to actually want to take the boat/ferry ride out to it. So, as I read this, that’s where I was watching you swim, from up there on the peak, you down there a tiny spec gliding through those waters to reach your goal. This is so inspiring. It doesn’t necessarily make me want to swim to Alcatraz. But it lights a fire to try something different, to make the most of this life, so thank you for that. Wow, thank you Julie Jo! 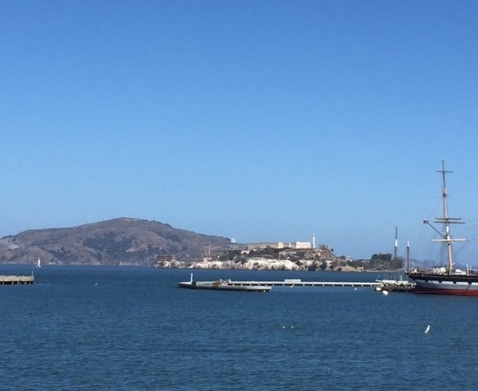 Next time you’re in San Francisco you MUST visit Alcatraz – it’s really a fascinating tour for kids and adults of all ages. You can do it! And bravo to you for getting out there and doing something even though you’re scared. I can’t wait to read all about it after you finish.